Although Russ teddy bears are mass produced they have always been made to the highest standard with strict quality control. No animal fur has ever been used to produce their plush toys and all materials are non-allergenic and surface washable for hygiene. There have been many different items produced by this company over the years but there are some brands which stand out. They are the traditional teddy bear range, the Luv Pets, Caress and Yomiko brands. The traditional Teddy bears look more like the toy bears you would have been given as a child and take their design from the much older vintage style toy bears. 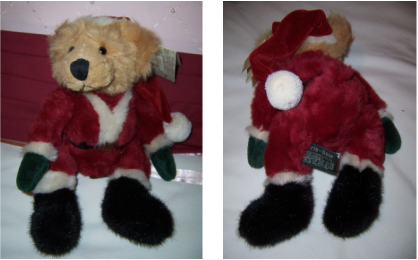 Russ Berrie bears are now retired and produced no longer, and as such have become highly collectible. 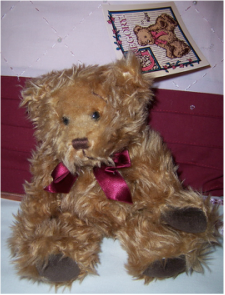 "Benjamin" is a bear made by Russ Berrie for the Country Classics series. He is in excellent condition and still retains his material tag to his leg and his original paper tag. "Brambles" is a bear made by Russ Berry in approx 2001.
. blue green colour similar to the heading colour of our text. He is in excellent condition and still retains his material tag to leg. This Russ Berrie Teddy bear is from the line of antique reproductions. They have all been designed by well known teddy bear artists. Gregory was created by Carol-Lynn Rossel Waugh. He looks in almost brand new condition, and has his original paper hangtag to his ear, and cloth tag to his body. 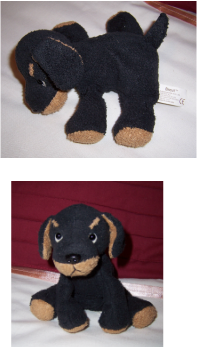 He has shaggy brown fur, little tail, darker brown velour type feet pads, plastic brown black button eyes, brown stitched mouth and nose, and eyebrows, and a burgundy satin ribbon around his neck. A lovely Russ Berrie antique reproduction teddy bear. Kris is dressed in a Santa outfit just in time for Christmas. .black embroidered nose and mouth.
. green material tag to body stating name etc. "Radclife" is a bear made by Russ Berrie, from the Bears from the Past Collection. He is a plush shaggy fur teddy bear with black eyes and stitched brown nose and mouth. He is wearing his original ribbon around his neck, and has a bean bag type of body fill. He is in excellent condition and still retains his material tag to his leg and his original paper hangtag. Ruby is a teddy bear from the ''Bears from the Past'' collection. She has red plush fur and is not jointed. She is wearing her original red ribbon around her neck with her original paper hangtag in her ear, and her green cloth tag on her leg. She is very light and is very soft and cuddly to touch. Russ Bear collectors don't miss out on Ruby. 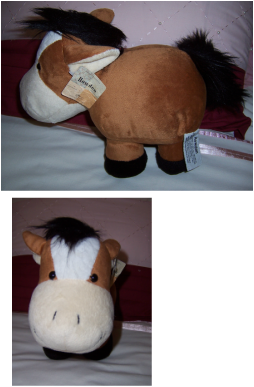 This large Russ Berrie soft toy is called "Howden" and is a horse. He is made of brown and cream soft fabric. He is very soft and cuddly.
. material tag to body stating name etc.